Why is it so important to choose the best Poo Pourri Scent? Well... the holidays are upon us, and this means house guests, parties, visitors... all of whom use the toilet. To keep your bathroom from smelling like a port-a-potty during a rock concert, use keep a little bottle of Poo Pourri where everyone can see AND USE it. 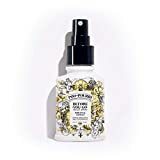 You can totally avoid the embarrassment of natural (yet plainly horrifying) bathroom odors with a few little spritzes of Heaven Scent Poo Pourri! Imagine... no more worrying about going in to the loo after Uncle Dave! No more fear that you will offend your future mother-in-law by filling the home with the odor of burning tires. Poo Pourri is a small bottle with a huge impact. Spray the surface of the water BEFORE using the toilet... (two to four squirts, depending on the size of your need) and the magical formula traps those deadly smells, and sends them into the pipes where they belong. Since Poo Pourri is made from essential oils and a bit of soap, it's non-toxic! (So the only toxins you are sending down the drain are the ones manufactured in your body). So What Is the BEST Poo Pourri Scent? What would you do before you Poo? Granted, everyone has different preferences, but in MY opinion, the Best Poo Pourri Scent is the Original Citrus. It's light and lemony, not chemical or oddly sweet (honestly, I don't want to think candy canes and gingerbread in the bathroom). Just fresh and clean. Made with Citrus and Lemongrass, it's like an open window next to an Orange Grove. Perfect for someone who grew up in Southern California. Available in 2 oz. and 4 oz. sizes... Don't forget to buy one for every bathroom. (And maybe even keep a 2 oz. bottle in the side pocket of your purse... to avoid that poop smell embarrassment in a public restroom). Each vial contains 5 ml...(about 10 sprays) which is good for a few poos. That Christmas Gift They Weren't Expecting! Yes, you can even get Poo Pourii in a GIFT SET! Can you just imagine the look on her face when she opens this package? The one for women is cute! Packed in a leopard print handled box, and contains 2 bottles of Poo Pourri (my favorite) Original, and a very special Call of the Wild scent (Ruby Red Grapefruit... citrussy, and therefore, acceptable). This is a gift she will never forget (and guys, possibly never forgive you for either). For Guys... The Craps Man Toolbox is a hoot! Poo-Tonium has a lemony smell... while Heavy-Doody is more woodsy... The perfect gift for THAT man in your life. Poo Pourri Now Comes in Holiday Scents! 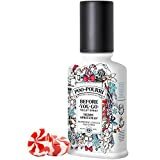 Holiday editions of Poo Pourri! Love Poo Pourri! I make my own too! But this stuff really works! 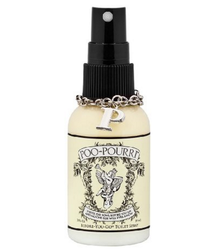 I got attracted by the name Poo - Pourri. The fragrance reminds me of spring and it looks aromatic and fresh. This kitchen island is big enough to use as a workspace, can easily be rolled to where I need it, and has a stainless steel top, making it heatproof and great for rolling dough.